If you need a special color, size, or shape that you cannot find elsewhere - we can help you. If you need custom - we can help you. If you can find what you need in stock, on-line or in a store, go for it. But if you can't, or if you want individualized attention and handmade uniqueness, let us know. We specialize in ceramic tile suitable for interior and exterior walls and floors, including wet areas. We work with architects, home builders, commercial builders, and homeowners - new construction or renovation. We design tiles, ceramic decorations, sculpture, architectural embellishments, and also create site-specific installation ideas. Browse the options to the left, or, if you are short of time and need some quick help, just Contact Us for fast individualized attention. Tiles and exterior ceramic details are high-fired to a vitreous state: they are frost proof and suitable for exterior and interior walls and floors, water features, pools, outdoor kitchens, fireplace surrounds, etc. 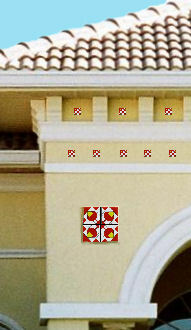 Missing or broken tiles can be matched to save a damaged wall or historic installation. Your design inspiration can be realized with an option beyond standard tile sources. You will not need to order tiles from a distant source and wait months for delivery. We are located in Central Florida and have a strong focus on reasonable delivery times and reliability. You will find a much greater range of colors and designs, in different sizes, than the typical showroom. You can specify what you want if we don't have it as a current offering. We will tell you if we can do what you wish and get you a prototype. You can have a tile or installation design unique to your home or building. We can make a personal visit to your (Florida) site and work with you on an overall design. We will tell you if we can't do something, or if we have a better option for you (especially for glaze matching). Arcana Tileworks® is a registered trademark of Arcana Tileworks LLC. Designs and site content © Arcana Tileworks LLC.